Kim Jong-un in front of new North Korean flag. 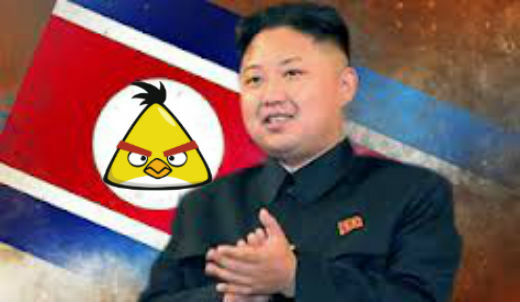 He replaced the red star with ‘Chuck,’ the yellow Angry Bird. CIA agents who inspected Asiana Fight 214, which recently crashed at the San Francisco airport, en route from Seoul—immediately smelled foul play upon entering the plane. After using CIA-style interrogation tactics on the captain of the Asiana, in an attempt to “further their investigation,” CIA agents discovered the pilot was hired by Kim Jong- un to crash the airliner into the Golden Gate Bridge. Brownski informed us that Angry Birds allegedly taught Chuck and his team everything they needed to know about suicide bombing. Most specifically, they learned how to properly angle their trajectory and how to crash into structures with kamikaze-style to inflict the greatest damage. 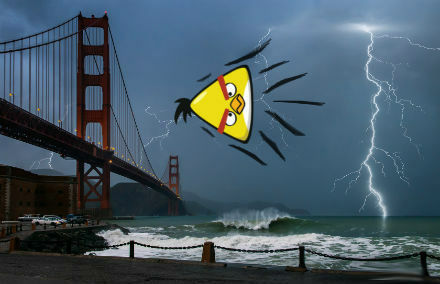 “Chuck frantically tried to reroute the plane toward the Golden Gate Bridge,” said Brownski, “But it was too late. Chuck aborted the mission, and between descending at an awkward angle, and being overwhelmed by fear of what Kim Jong-un would do to him and The Yellow Birds of Fury for botching the mission, he failed to land the Asiana safely on the runway. This entry was posted in Breaking, News and tagged Angry Birds, Asiana Flight 214, Golden Gate Bridge, humor, Kim Jong-un, San Francisco, Top stories on July 15, 2013 by The New Porker.